In another case focusing on the gig economy, the London Central Employment Tribunal has ruled that a CitySprint bike courier was a worker under the Employment Rights Act 1996. 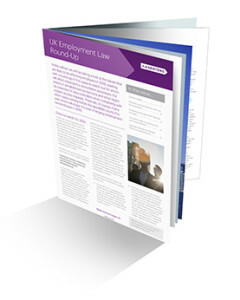 In Dewhurst v CitySprint UK Ltd, the tribunal decided that Maggie Dewhurst was not self-employed and was instead a worker, despite her contract saying the opposite. Now Ms Dewhurst will receive employee rights given to other workers, such as holiday pay and sick pay. CitySprint will also need to pay Ms Dewhurst the National Minimum Wage and National Living Wage. While this decision only affects one employee directly, many employees are likely to make similar claims following the decision. In the decision, the tribunal focused on what was happening in reality and not the wording of the contract (actually entitled a “Confirmation of Tender to Supply Courier Services to CitySprint Ltd”). The tribunal was critical of CitySprint’s use of confusing wording and a tick box recruitment form for the terms of the employment. The tribunal also considered a number of factors regarding Ms Dewhurst’s normal day, demonstrating that she was integral to the business and had no control of her own working day. CitySprint calculating the payments due to her and paying her in arrears, rather than self-billing via invoices. CitySprint has called on the government to provide better support and help for businesses across the UK. The government is due to report in the spring on modern working practices. Uber, which received a similar ruling in October 2016, intends to appeal the decision. With many courier companies likely to be in a similar position, it remains to be seen what will happen next with the gig economy. From 6 April 2017 those applying to come to the UK to undertake certain jobs, along with their adult dependants, will be subject to the requirement under the Immigration Rules to produce a criminal record certificate. The certificate must be produced from any country in which they have been resident for 12 months or more, consecutively or cumulatively, in the previous 10 years, aged 18 or over. From January 2017, sponsors must start informing prospective employees at the point they assign their Certificate of Sponsorship that they may become subject to this requirement by the time they make their application. This will enable them to begin seeking certificates where needed at the earliest opportunity, and to lodge a complete application for entry clearance sooner. Welfare professionals not elsewhere classified. The requirement to produce a criminal record certificate already applies to those applying under Tier 1 (Entrepreneur) or Tier 1 (Investor) and any adult dependant relative of the main applicant in either of these categories. 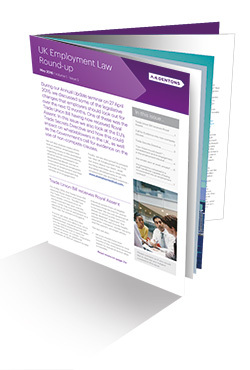 Welcome to the December edition of our employment law round-up. In this edition, we couldn’t fail to give you an update on the most important piece of constitutional litigation of our time, which has been heard by the Supreme Court on Article 50. Other festive treats include a summary of recent restrictive covenants cases (first published on HR-Inform) and unfair dismissal litigation. We have also given you our take on calculating rest breaks for workers, and the dangers of using employees’ personal data unlawfully. During our Annual Update seminar on 27 April 2016, we discussed some of the legislative changes that employers should look out for over the next 12 months. One of these was the Trade Union Bill having now received Royal Assent. 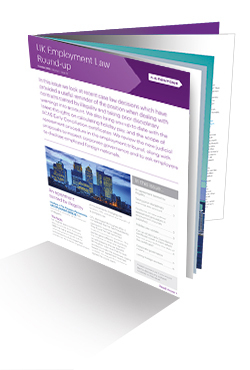 In this issue we also look at the EU’s Trade Secrets Directive and how this could impact on whistleblowers in the UK, as well as the Government’s call for evidence on the use of non-compete clauses. We will also analyse cases which look at whether employees have a right to privacy in the workplace regarding email communications, whether terms contained in an employee handbook can be incorporated within an employee’s contract of employment and how tribunals should approach the remedy of re-engagement. The European Parliament has now passed the new General Data Protection Regulation. This will come into effect in 2018. The Regulation does make some changes to the law currently implemented by the Data Protection Act, which employers need to be aware of. In particular, the Regulation sets out tighter requirements for obtaining consent from employees to processing their personal data. The current law requires that this consent must be “freely given, informed, and specific”. Under the new Regulation it must also be “explicit”. In addition, it states that where consent is given in a written document which also concerns other matters, it must be presented in a manner which is clearly distinguishable from those other matters. This will have implications for employers who seek to obtain consent to data processing in the employment contract, as is often the case. Applying the Regulation, this would not be sufficient. This can probably be dealt with by asking staff to sign a separate document consenting to the processing of their data (in the same way that Working Time Regulation opt-outs are usually signed now). Employers will need to be careful of the wording of the consent forms to ensure that consent is freely given. They should also make sure that employees know exactly what they are consenting to. 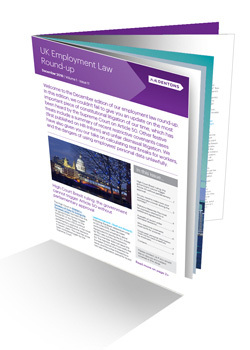 In this edition we will be taking a look at the issues that are likely to be affecting employers in 2016, starting with a round-up of the cases to watch out for which will affect redundancy consultation processes, the extent of whistleblower protections and what might be expected of data controllers when complying with subject access requests. There are, of course, many other cases coming before the appellate courts this year which will shape the ever-changing employment law landscape in 2016.